Representing four years of dedicated labor, the Murdy Family Organ will be the 36-year-old studio’s most ambitious piece for any client. The University of Notre Dame’s inaugural Sacred Music Conference will be held Thursday through Saturday (Sept. 13 through 15). The conference will feature sacred music from the Renaissance to the present day and will bring together composers, scholars and conductors of sacred music to discuss, share and perform their work. Several concert events are open to the public and free of charge. Sacred music is foundational to many of the world’s artistic traditions, and this is especially so when it comes to Western music. It is also an artistic — and academic — area that continues to grow and develop. To celebrate and promote this diverse art form, the University of Notre Dame is launching a Doctor of Musical Arts (DMA) program with majors in organ and choral conducting, beginning in fall 2013. “Given Notre Dame’s educational mission, its Catholic foundation and our recent investments in faculty who are recognized leaders in sacred music, the University is uniquely poised to develop young musicians to serve the Church and world,” says John T. McGreevy, I.A. 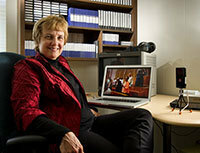 O’Shaughnessy Dean of the College of Arts and Letters. With the support of a Lilly Endowment grant of $1.9 million, Sacred Music at Notre Dame (SMND) is poised to help congregations across the region renew worship practices and enliven musical expression to engage people more deeply, across the generations. The grant will enable SMND to begin building creative partnerships between academia and communities of worship and to sponsor activities designed to teach sacred music to young people. A central project will be sending graduate students from Notre Dame’s newly founded Doctor of Musical Arts and its successful Master of Sacred Music programs into local churches to strengthen existing children’s choirs or establish new ones. Applications will be available by March 15 for churches interested in hosting an organist or choral conductor from Notre Dame for a period of two or three years.